It's time again to make your plans to join fellow C-Brats at Hontoon Island State Park located on the magnificent St. John's River near Deland Florida. 2019's dates are from Tuesday March 5 thru Thursday March 7. But many cruise the river and its tributaries before and after the gathering. If you have attended in the past you know we have some day trips, some C-Dory seminars, evening potluck meals, great fellowship around the campfire, Colby S'mores, Lee's ice cream, Clow's fund raiser auction and much more. The Thataway Crew (Bob, Marie and Angel) will be there a few days early and stay a few weeks later for one best gathering on the C Brat planet. You can count us in. Added to Calendar and Signup list in place. Unless I'm frozen in, in the Midwest, Rosanne and I will be there. Don't have our exact dates planned out yet, but suspect we will arrive to launch in the area Sunday, and then stick around at least a week or longer after the gathering. 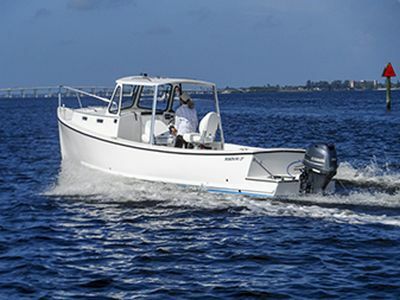 Unless we're frozen in, in a Biscayne Bay FL area adventure, Eileen and I will be there (so, same two 255's as last year, huh? Maybe 3, if BTDT finally shows up). Colby, 81 degrees and sunny today. Why not make your 'first' boating adventure of the new year/season 6 weeks in Key West at Stock Island Marina with us in 2 weeks? We’ve attended quite a few C-brat gathering across the country but for us the Hontoon Island gathering last year was by far the best. You need to come early and attend the pre-tour and post tour of all the back channels and see the huge variety of birds, ‘gaters, manatees and blue springs. Without a guide it would take years to find it on your own. Unfortunately, we can’t make it this year, Penny just had Hip Replacement surgery. She limped around last year with a knee problem that turned out to be a hip problem. She is really agile with her “walker” but that’s not a good bet on board a boat. Oh well, there is always 2020. Eileen and I will be there (so, same two 255's as last year, huh? Maybe 3, if BTDT finally shows up). I'm planning on being there but not signing up, as every time I do, I seem to end up in the hospital losing or replacing body parts. Wow ....lots of early interest. New park manager this year but all is well. For those like Chuck that can’t make it this year plan for 2020. As now Wendy and I will be there by car but without the boat. Looking forward to good friends and great times. Having joined this forum last year and looked hard for an Angler 22 with no luck I bought an Atlas Pompano 23. Tom said all boat owners who subscribe to the C-Dory philosophy, and I certainly do, are welcome at Hontoon. So I will be there. Below is a pic of the boat. 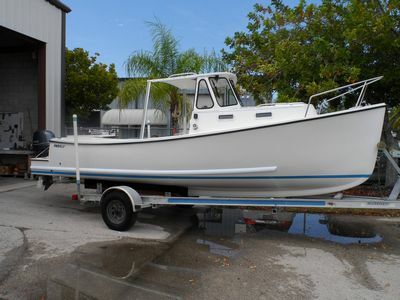 It is similar to the C-Dory but it has a shallow full keel. 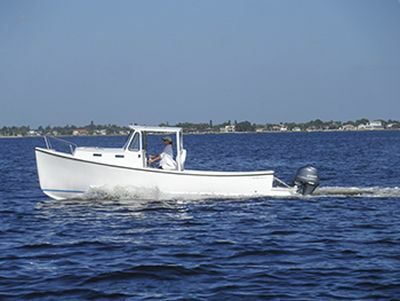 It is a downeaster style boat that has been adapted to an outboard with the addition of the motor mount bustle. Looking forward to seeing y'all at Hontoon. Serendipity (C. A. and Bettie) will be there early and stay late. So looking forward to it after missing last year. Oh boy!! Marcia and I are in, too! We’ll arrive 2-3 days early and probably stay about a week after. Also, Marcia is retiring on 2/1, so this will be our first big retirement excursion. Heading to the Keys for a month or so after that.